The New Wolsey Theatre’s annual pantomime isn’t just your regular, run-of-the-mill celebrity-filled affair. It’s a Christmas show with a difference: a rock ‘n’ roll panto. All the typical stuff – from the outrageously dressed dame to the morally questionable love story – are here, but they’re accompanied by a banging soundtrack of classic rock songs, all played live on-stage by the cast. This year’s show, Sinbad, put together by artistic director Peter Rowe, is no different. Sinbad the Sailor (Steve Rushton) and Princess Pearl (Daniella Piper) are in love, but Pearl’s father, the cantankerous Caliph of Constantinople (Daniel Carter Hope) has betrothed her to the dastardly magician Sinistro (Dan De Cruz) instead. To win his love’s hand in marriage, Sinbad must travel to the fabled isle of Nirvana to seek his fortune, accompanied aboard his ship – The Saucy Sausage – by his mum Donna (Graham Hent), her would-be lover Tinbad the Tailor (Rob Falconer), and a motley crew of surprisingly feminine pirates. Naturally, chaos ensues, and Rowe’s energetic cast power through it all wholeheartedly. 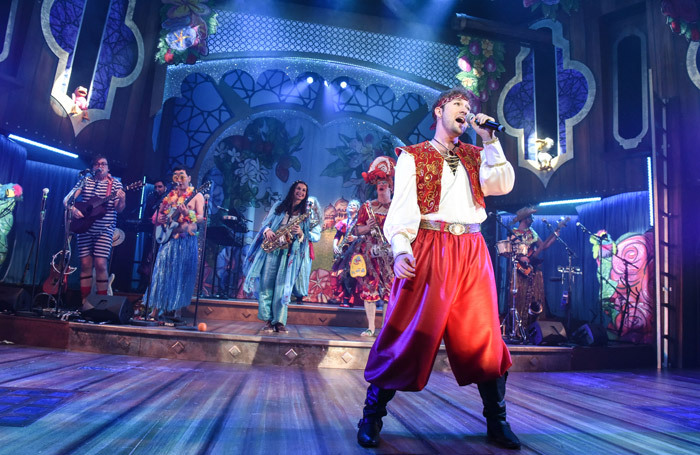 Rowe sprinkles the classic panto action with a set of toe-tapping covers of popular rock anthems, from Donna Summer to Queen, Bon Jovi to Deep Purple. A raucous rendition of REM’s It’s The End of the World (As We Know It) and a show-stopping performance of Huey Lewis’ The Power of Love are the evening’s particular highlights. They ensure that Sinbad ultimately succeeds: another enjoyable edition of an established Suffolk institution.